A showman Jerry Flynn has to find a new sensation in order to save his production from getting closed. He has a warning from the theatre owner to make matters worse. As he is looking out for a 'sensation' through which he can make money, he comes across a boy named ‘Pinky’ and he discovers a dancing caterpillar ‘Curly’ with him. Curly was not an usual caterpillar, it could dance. Looking at this, Jerry is convinced about the dancing caterpillar being the rescue agent. The mean minded that he is, he promises Pinky to make ‘Curly’ a superstar and Pinky agrees on one condition that, he wouldn’t be selling ‘Curly’ at any cost. As he fights with Pinky’s elder sister played by Janet Blair over this issue, Jerry secretly makes a deal with the Walt Disney after ‘Curly’ was perceived as a big jackpot. The rest of the movie is a series of incidents that makes ‘Curly’ very popular much to the delight of Jerry Flynn played by Cary Grant. ‘Curly’ had become so popular that, one of the war planes was painted with a picture of Curly. The controversy with the caterpillar and its ability to dance arouses a lot of attention with the scientists as they challenge to undermine the caterpillar’s ability. Amidst of events, Pinky becomes aware of Jerry’s intentions and the movie culminates with Jerry understanding the kid’s sentiments and allows ‘Curly’ to have a life of its own. 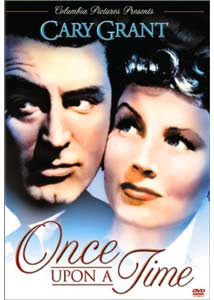 Released in 1944, Once Upon a Time was a disaster due to its bad screenplay. Directed by Alexander Hall, this movie fails and failed to capture the minds of the audience.